One thing I love about Courtney Carver’s Project 333 is her careful clarification that it is not a “project in suffering”. The rules are there for you to follow, modify, adapt, or ignore. If something wears out, replace it. Swap things that aren’t working. It’s a great system and starting point that can be adjusted to different climates, lifestyles, and body types. I deviate from the rules of P333 by not counting my shoes and accessories (or my outerwear in colder seasons–I count sweaters and jackets that would be part of my outfit but not coats that I would only wear out in the elements). 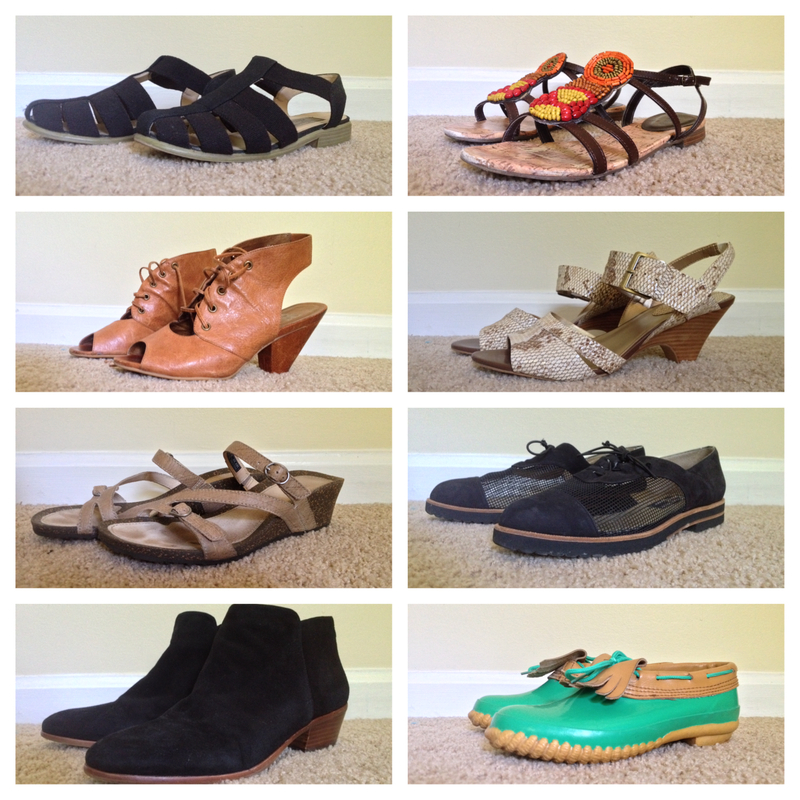 I include up to 33 items of clothing and 8-10 pairs of shoes. In my summer collection, I have four belts, three scarves, and a selection of jewelry (though I generally wear the same 5-10 pieces). Obviously this ends up being much more than 33 items. I may try a strict 33-item wardrobe in the future, but for now this system works for me. It has helped me ease into a lighter way of living. I also still do some shopping while participating, though I try to focus on finding specific items rather than impulse buys. I mentioned in an earlier post that one top has left my collection, and I’ve added in one dress and one pair of jeans. I also left some space in my original count to add a few things. My galoshes are also falling apart, so I’ve swapped them for some brown loafers that will work for rainy days. After my initial closet clean out in March, I realized I no longer had a green top in my wardrobe. Green is one of my favorite colors, so I’ve been on the look out for a flattering and versatile top to fill this color hole. This month I finally found one! It cost a little more than I wanted to spend, so I left the tags on while I considered. Then something lovely happened: it went on sale! I was able to get a price adjustment and receive about a third of the cost back, and now I feel great about my purchase. This is a year round shirt that I can wear under or over things, buttoned, tied, tucked or untucked. It’s the perfect shade of mossy, forest-y, olive-y green. I feel a different sort of delight with this purchase. Rather than the adrenaline rush of spending money and acquiring something new, I feel something more akin to when I finish a project or complete a household chore. It’s satisfaction, not velocity. I think I’ve discovered a different kind of shopping. This week I’ve made two more purchases of this sort. I have been looking for some jean shorts that fit the following criteria: not cut off or distressed, not too short or too long, mid-rise, dark wash, good quality, inexpensive. After months of scouring the thrift store and trying on plenty of duds, I finally found some that fulfilled all my requirements! So these are going into my capsule wardrobe, and just in time, as temperatures are in the high 90s Fahrenheit this week. Jeans are starting to get a little too hot and sticky most days. I also had a top hit the wear out point. My blue and white striped tee (J.Crew, purchased at the thrift store over three years ago) was already starting to fade, but this week it got a hole. Goodbye, striped tee. It survived longer than I ever expected, especially considering I wore it when I was nine months pregnant. I don’t know how it returned to its original size after so much stretching! But now it’s done. Stripes are a staple for me, so I knew I wanted to find an alternative. I bought a blue and white more subtly striped Gap tee from the thrift store, and it will be replacing my old one. I am about midway through this season of the project, and these adjustments help my closet feel fresh and interesting. The best thing about my new additions, though, is that they inspired me to remove some things. I filled a shopping bag with clothes and accessories to donate, and I love that clearing out is now a part of the shopping process for me. Shopping involves maintaining my closet, not just endlessly growing it. 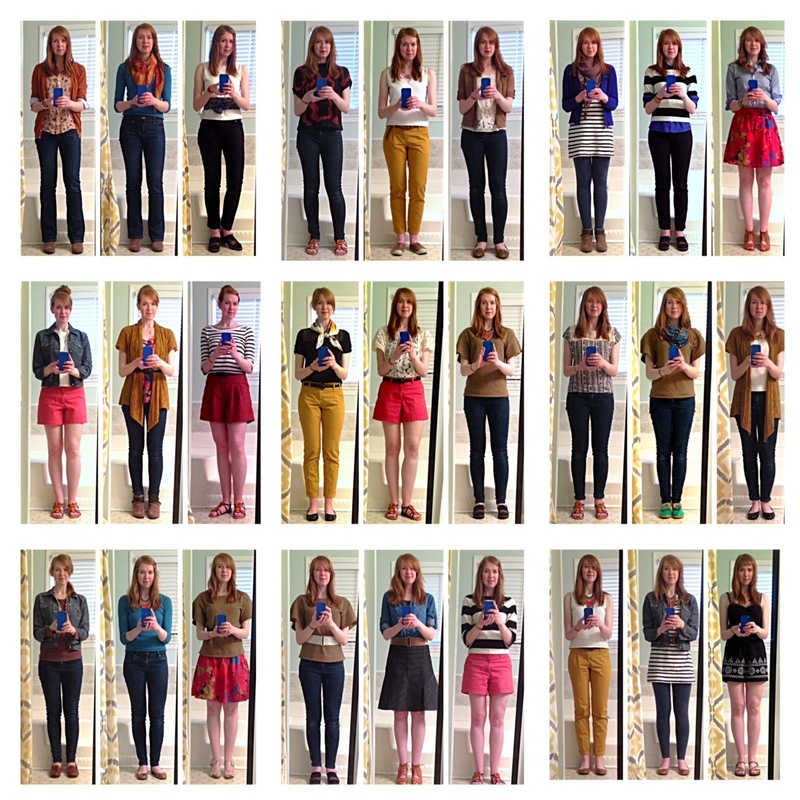 I’m about six weeks into my second round of Project 333, a minimalist wardrobe challenge that involves wearing just thirty-three items of clothing for three months. I bend the rules by not counting shoes and accessories in my 33 items, though I’ve chosen to limit those as well. 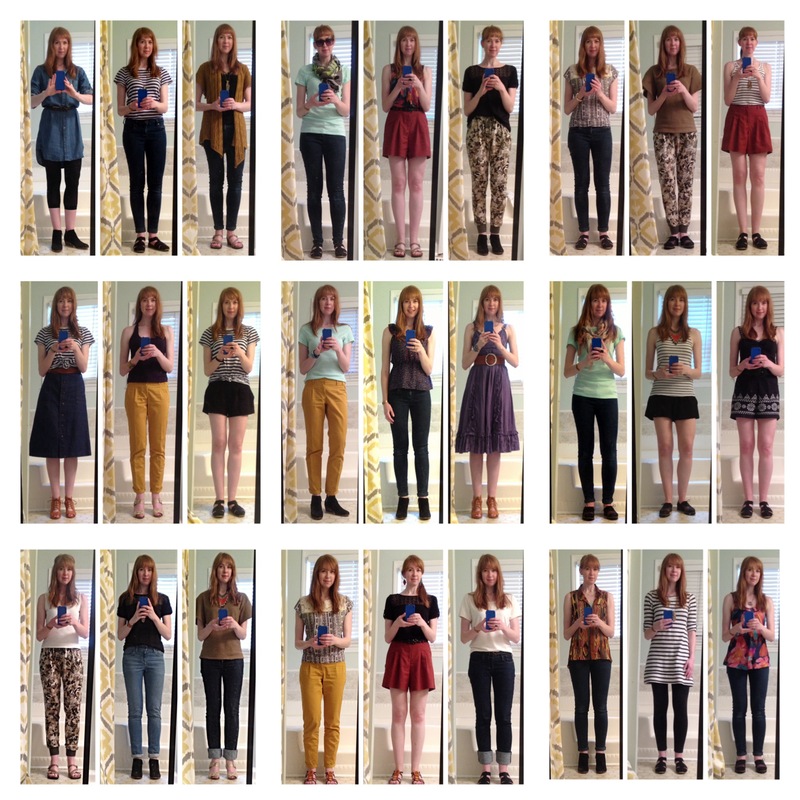 I started this round with 28 items of clothing, and I have since lost one item and gained two (more on that later!) to bring my working total to 30. I left a little space in my count this time so I could fill some holes or bring in a couple fresh items, and I think this is a good approach for me. Like I mentioned, I have made a couple modifications to my collection since beginning this round. The mint tee (seen in the fourth outfit from the top left) has not survived. Pasta with marinara sauce, a toddler, and overly ambitious stain removal tactics left the top with two large bleached out circles. So that shirt has left the collection. 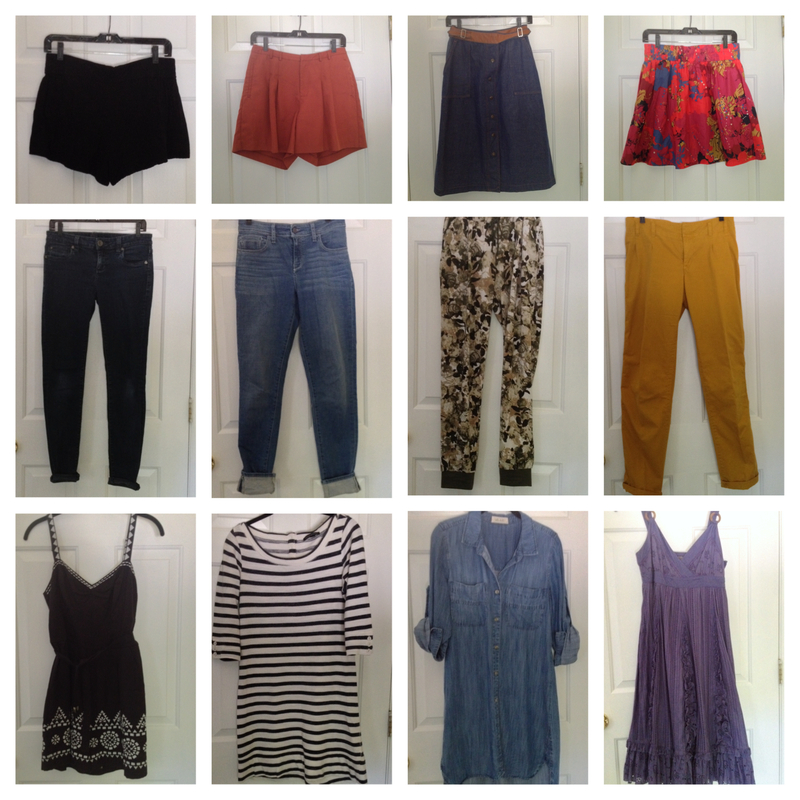 I have added two items that were both hand me downs (hand me overs? 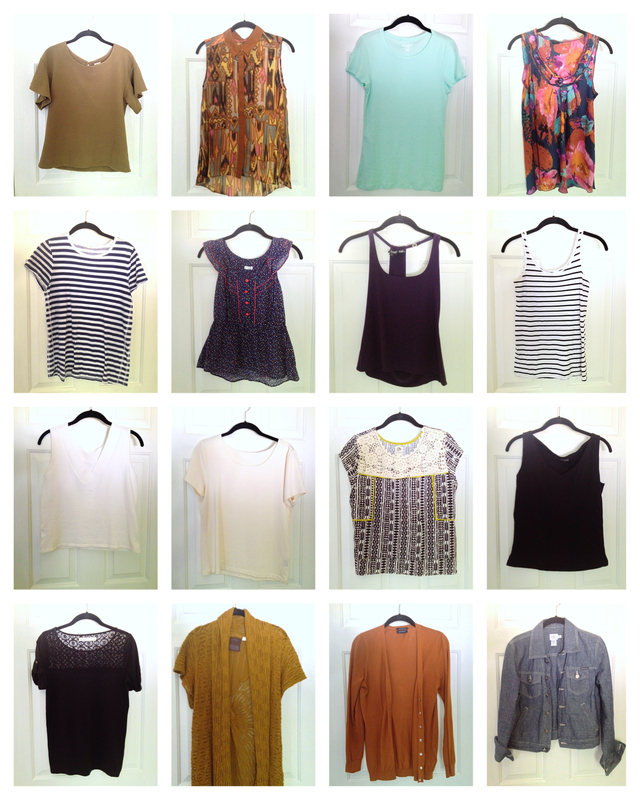 ): a maxi dress not yet pictured and a pair of straight leg designer jeans (seen in the bottom row, third from the left). 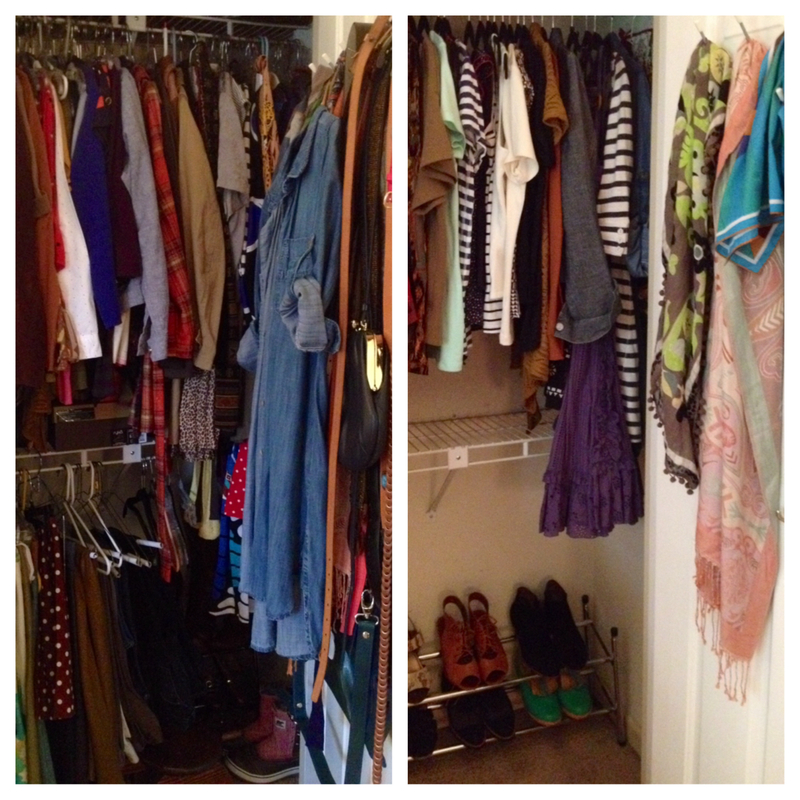 Free clothes can be a help or a hindrance to dressing with less. In this case, these two items fit me and my style well, and they filled gaps in my wardrobe. I was thankful to accept these generous offers. 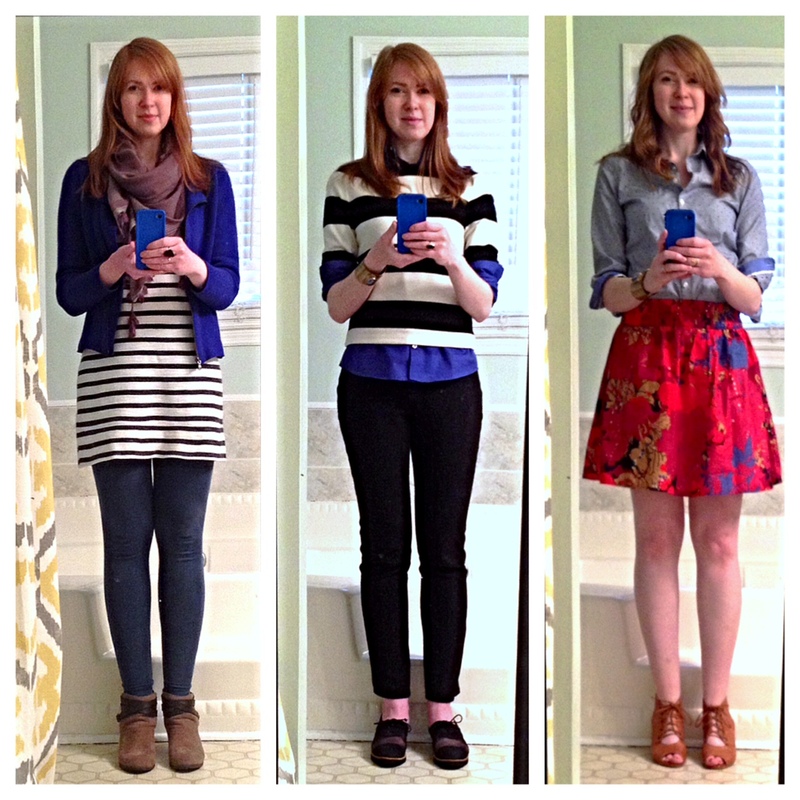 I’ve also noticed some differences in seasonal capsule wardrobes. In my first round, I tried to make a different outfit for each day of the project. I made a game of it, and I enjoyed the creative styling challenge. Making unique combinations was easier when the weather was cooler and I could layer sweaters, jackets, and scarves. Though I have fewer layering options in the summer heat, I’m still finding plenty of new combinations. I’m also repeating outfits at will. The second outfit from the top left (striped tee, dark skinny jeans, black canvas sandals) has been one of my summer favorites. Another aspect that makes summer more challenging is laundry. I live in the Deep South of the United States, and the weather gets HOT! Sweat is an unfortunate summer reality, and my items require more frequent laundering this time around. I have adjusted, but I’ll be happy when the weather cools down again in a few months. 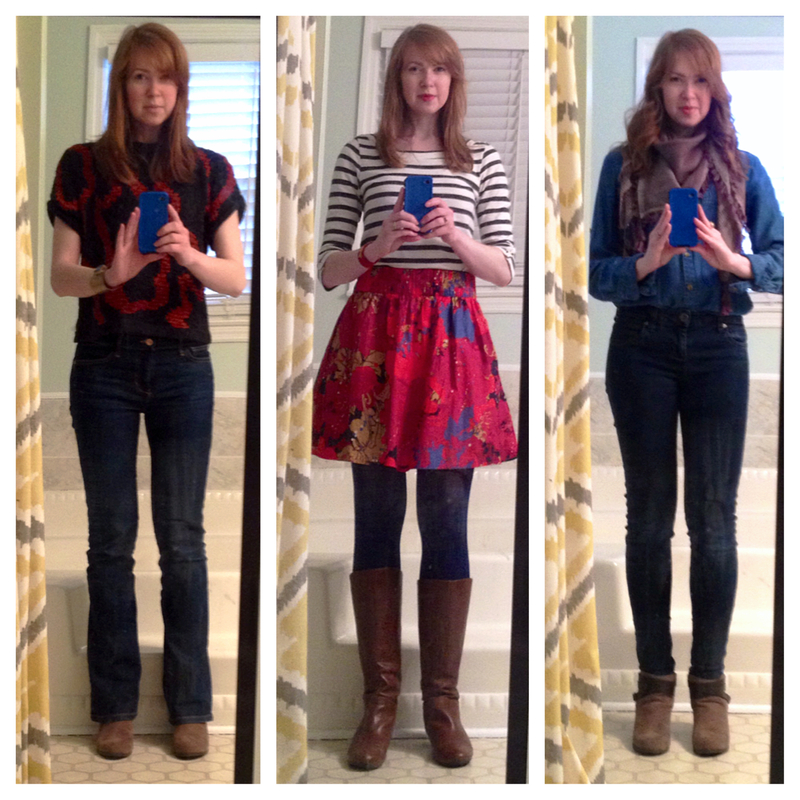 I have now been dressing with less since March, and I am dressing with more freedom and confidence than ever before. I haven’t fully cracked the code on my impulse shopping, but I’m making strides. I can now say with assurance that I have enough. Thirty-three items are enough–more than enough, even. I would rather have a closet contain 33 items I love than one bursting with things I sort of, kind of like. 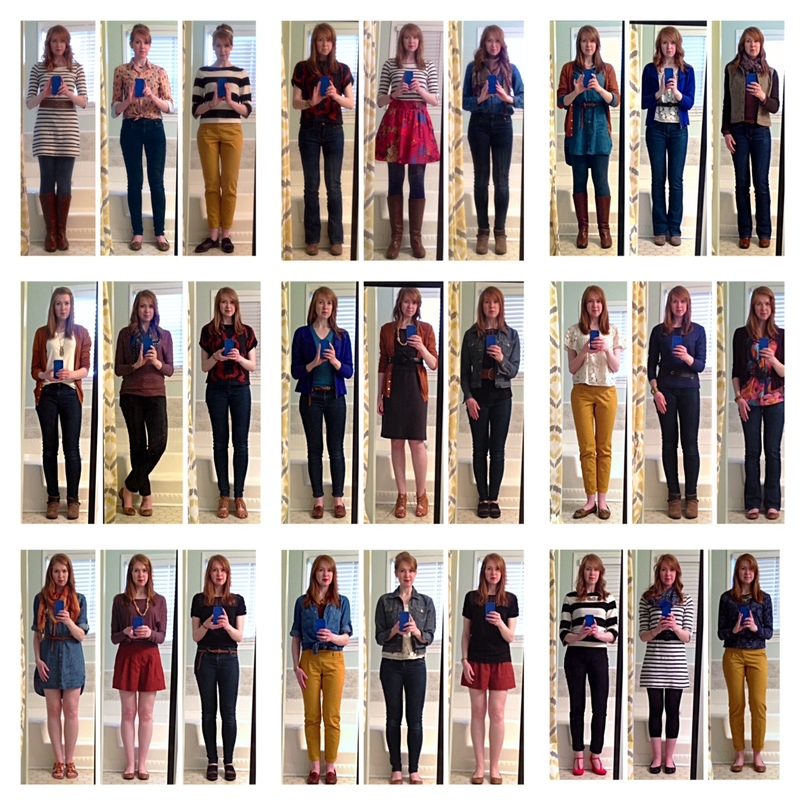 Are you thinking about trying a capsule wardrobe or Project 333? Are you already dressing with less? I’d love to hear about your experience!